"What do you do?" Let me paint the story. In the current culture, each step of product development occurs in a separate silo. 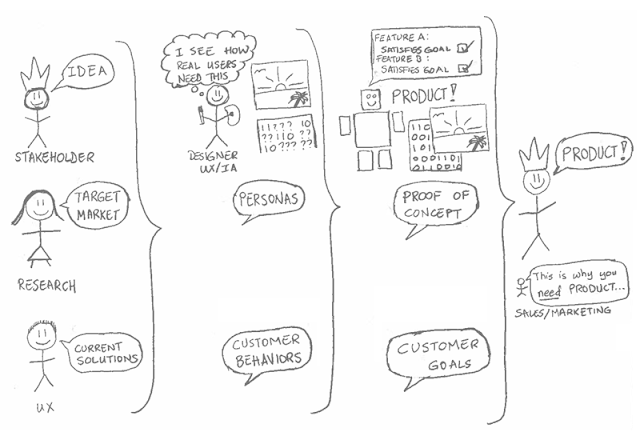 In the beginning, the stakeholder thinks their product is awesome! And in their head, it's probably the best product imaginable. By the end of the product cycle, they get a product that isn't what they imagined. Endless tweaks are made. Meanwhile, the product features are used to market and sell it. The new culture focuses on building better products for our users. By injecting both market Research and Strategic Insight (RSI) and User Experience (UX) into every step, we add customer information as the foundation to each silo; we avoid feature-driven products. In the end, we help the stakeholders realize their idea. In the end, we help designers understand customer behavior. In the end, we help developers create real solutions. The end goal: we help the stakeholders tell the story of their products. Thanks to C S for making me think more about this and draw these images. I'm glad all the posts from your RSS feed recently appeared in feedly. This refresh enabled me to come across this blog post I missed in 2011. I like how you included the target market and personas in the second illustration. Very true and needed. I would hope most designers would ask for them if they are not provided. How can a designer design something without an audience in mind? That would be mere layout and not truly designing.